Mungo knelt in the dirt, weeding his flower garden. The tulips and daffodils were beautiful this year. He felt the tulip petals. They were soft, like silk, and the brightest red tulips he’d seen in his garden. The sun was lowering quickly. Already its rays lined the clouds with gold. Ginger, his cat, came sauntering towards him. She’d been out running through the hills, chasing mice. He loved Ginger and showed her by stroking her as she walked past. "Time to go inside and get ready for the bairns. They’ll soon be here," he said. Mungo picked the cat up and carried her into the house. "I hate to lock you in the bedroom every week, but it’s the way it has to be," he said, chasing her into the room and shutting the door. DING DONG! "And so it begins," Mungo smiled. He opened the door and looked down. There stood wee Hamish, wee Fiona, Andy, Gavin and Gregor. "Come in bairns," Mungo said. "Where’s Morag?" "She’s sick today," Gregor said. "Her mum called my mum and told her." "I’m sorry to hear that," Mungo said. "I don’t want Morag to be sick," whined wee Fiona. "I like her. She’s my friend." "I’m sure she’ll be well soon. Today I am going to tell you a story. There have been a lot of things happen today that made me think of this one," Mungo said. "They weren’t bad things, were they?" Andy asked. "No, not really. Why don’t you bairns help yourselves to a snack? I’m going to let Ginger out of the bedroom. It’s time she joined us, don’t you think?" he asked. "Yes, let Ginger come and be with us," wee Fiona said. "I’ll let her out, but please, just ignore her. If she comes near you, its all right to pet her though," Mungo told them. He got up and walked to the bedroom to let her out. When he came back through, he noticed that the bairns weren’t eating their snacks. "What’s the matter? Is nobody hungry tonight?" "It’s fruit," sighed Gregor. "Fruit isn’t a real snack." "What? Of course it is. Fruit is delicious. Look here, you’ve got apples, red and green ones, oranges, bananas, grapes, and plums. Just taste one," Mungo urged. "I like fruit," Andy said; reaching for some plump, juicy, green grapes. "These are good," he said, popping another in his mouth. Soon the others followed his lead and were eating the fruit. "Let’s begin our story," Mungo said. "A long time ago, over one hundred years, there was a dog named Bobby. He was a Skye terrier. Do any of you know what those look like?" Mungo asked. "No," they all said, their mouths full of fruit. "I happen to have a photo of one. Look here," Mungo said, opening an encyclopedia. "This is a Skye terrier." "That’s a cute dog," wee Fiona said. "It’s got lots of hair," Gregor added. "Yes, it is a cute dog. Bobby was a cute dog. He lived in the country, just a few miles outside of Edinburgh. A wee lass owned him. He liked to wander around and visit the neighbors. Sometimes they’d feed him bits of roast beef or give him a bone. One man, named Old Jock, was particularly nice to Bobby. Every time Bobby came by, Jock petted him and fed him good food. Jock spent a lot of his time tending sheep. Bobby loved to chase the sheep and helped Jock take care of them. Bobby spent more time with Jock than he did with the wee lass. "One day Jock moved to Edinburgh. He was getting very old and it was too hard for him to live by himself and take care of the farm. Bobby ran over to visit him and he wasn’t there, so Bobby ran all the way to Edinburgh and searched for Jock. He ran up and down the streets, looking everywhere for him. Finally, he found him," Mungo said. "I’m glad he found him. Bobby loved Old Jock, just like Ginger loves you," Gavin said. "You’re right, Bobby loved him and Ginger does love me." "What about the wee lass that owned Bobby. Didn’t she miss him?" Gregor asked. "The lass knew that Bobby loved Jock. When he ran away, she didn’t know where he was. She never went to Edinburgh. Her mum bought her a new puppy and she was happy with that. Now, when Bobby found Jock, he sensed that there was something very wrong with him. He knew that Jock was sick. Instead of running back to the country, he stayed right by Jock the whole time. After a few days, Jock died," Mungo said, a sad expression crossed his face. "Oh no," cried wee Fiona. "I don’t want Jock to die. What will Bobby do without him?" "Me neither. I want Jock to live," whined wee Hamish. "This was a long time ago, bairns. There’s nothing we can do about it now. Jock was very old and sick. It was his time to die. Bobby started to bark. He wanted to let some of the people who lived nearby that Jock had died. He didn’t want Jock to lay out in the dark. Someone from a boarding house heard Bobby. They came down to see what he was barking about and found poor old Jock. Bobby was sad. He whined and whimpered all night long when they took Jock’s body away. When it was time to bury him, Bobby walked with the funeral procession all the way to the grave at Greyfriar’s Cemetery. Some people called it a kirkyard. It means a cemetery on church grounds." "Bobby wanted to stay by Jock’s grave but they wouldn’t let him. The cemetery caretaker chased him away. Bobby snuck back in every single night and stayed by Jock’s grave. Some of the neighbors saw him and started feeding him and giving him drinks of water. They thought it was wonderful to see that Bobby loved Jock so much that he stayed with him, even after he had passed away," Mungo told the bairns. "How long did he stay there?" Gavin asked. "He stayed by Jock’s grave until he died. That was fourteen years later." "Fourteen years? Bobby stayed on the grave for fourteen years?" Gavin said, surprised. "Yes. He loved Jock that much. 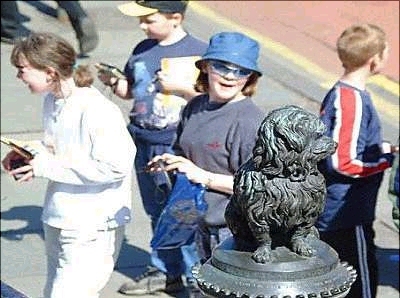 There’s a wee statue in Edinburgh of Bobby, the Skye terrier. If your mums and dads ever take you there, go and see the statue and remember Bobby." "I wonder if Ginger would stay by your grave?" asked Gregor. "Cats are very different from dogs. I don’t think she would. It doesn’t happen too often. If it did, then it wouldn’t be that special, would it?" Mungo said. "Bairns, finish your fruit. I am going to give each of you a piece of paper and some crayons. I want you to draw me a picture of Greyfriar’s Bobby." He got up and gathered the paper and passed them out to all the bairns. For the next hour they drew pictures of the dog. Some of them added Jock and others drew pictures of the statue. Mungo had shown them a photo of that too. "These are lovely pictures you’ve drawn. Take them home and put them on your wall and when you look at it, remember wee Bobby." DING DONG! The parents arrived to pick up their bairns. "Would one of you please tell Morag that we missed her?" Mungo asked. Just then, wee Fiona walked back to Mungo. "I’m going to take Morag my picture of Bobby and tell her the story." Mungo wiped the tear from his eye. "That’d be nice, lass, very nice." He gave her a big hug and she ran back to her mum. That night as Ginger lay on Mungo’s lap, he petted her and was very thankful to have her. He thought of Greyfriar’s Bobby and hugged Ginger tightly. He held her for a long time, until he fell asleep in his chair. Click the picture above to do the jigsaw! Perhaps you can help save this breed?